Some of the posters that were posted around campus have been turned in to Dean Brown's office. Photo by Adria Walker. On Friday, February 9, an anonymous student (or group of students) posted hand-made flyers and written-on sticky notes around the Leggett. Signs included statements like: “Give Victims Law Guidance,” “Increase security @ the gates or what’s the point?”, “Why aren’t there more lights on campus?” “Saw a sexual assailant in the caf what’s new?” “Millsaps ‘Fires’ the TITLE IX Coordinator with no explanation COINCIDENCE” and “Millsaps protects sexual assailants”. Demi Brown, associate dean of intercultural affairs and community life and a Title IX coordinator, says that by the time he made it to campus on Friday, many of the posters had been taken down. Brown says that the posters were not taken down in a single effort by the college, rather that various parties on campus made the decision to remove the posters. Though, he says, the college administration’s conversation around taking down the posters was content neutral, some parties ultimately made the decision to remove posters in an attempt to follow college guidelines. According to Major Facts , student organizations “must register their events with the Office of Student Life before hanging signs, writing on sidewalks, or distributing flyers around campus.” The policy does not say anything about students who want to put up posters independent of a student organization, but presumably this policy also means independent students need the college’s permission. 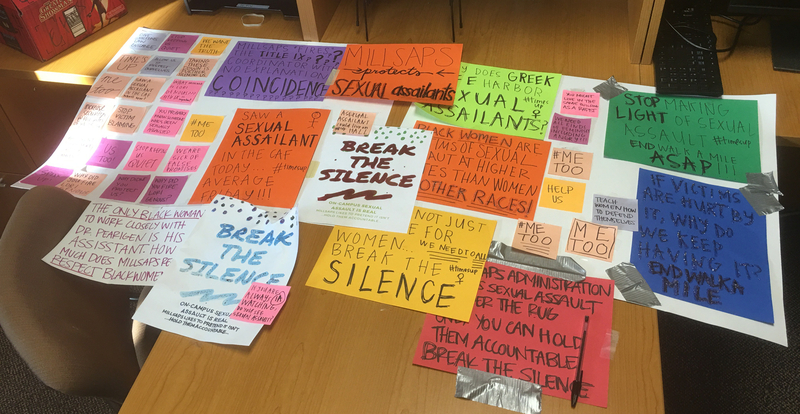 He thinks that the problems referenced in the posters, such as failure to prevent sexual assault and to protect sexual assault survivors, are not Millsaps-specific problems, but problems nationwide. “I take it as a movement that’s coming across this country that’s saying that the environment that women have had to endure in our country is unacceptable, and we need to change those things,” Brown says. Brown alluded to larger, nationwide movements like #MeToo and #TimesUp. Brown encourages students to actively participate in holding the College accountable and to be present in discussions about reshaping Millsaps. Whoever put the posters up presumably did so knowing that the College’s Board of Trustees would be on campus for their first meeting of 2018. After the postings, Brown says that President Robert Pearigen called a small group meeting to discuss the College’s response to the incident, to figure out how the College would work to better serve students and how to adequately inform students of Title IX office changes. Brown says that he and one of the other Title IX leaders, Julie Daniels, as well as Dean Brit Katz, Chief John Conway and Vice President of Enrollment and Communications Rob Alexander were all present at the meeting. According to Brown, the College’s priorities are insuring that they follow the Federal mandates and guidelines, but also that they are serving students. Still, he does not know that there has ever been a time during which students were allowed to air their grievances about the ways in which the College handles sexual assault or any other issues. On February 14, the President sent out an email to the Millsaps College Community that seemed to, in part, allude to the posters or to have stemmed from discussions about the posters. The email read, in part, “In the coming days you will be hearing from Demi Brown… about opportunities for us to hold some important conversations related to our life here together on campus. It is my sincere hope that we will move toward an atmosphere that allows us to fully live into our mission statement and our goal of ‘open inquiry and free expression’.